VMworld is right around the corner and as many of you are finalizing your schedules we thought it would be a great time to highlight the PowerCLI activity that will be going on. Below you will find PowerCLI Sessions, Group Discussion, and Hands on Labs that will be going on during VMworld. Any other updates/hangouts/activities related to PowerCLI that I find out about, will be tweeted with #PowerCLI. GET READY FOR A GREAT VMworld! The following is a list of sessions that leverage PowerCLI. The Session ID is linked to the VMworld Catalog description for each. Tips, tricks and best practices. See how PowerCLI is the easiest way to automate your SDDC. If you have not attended the vBrownBag Tech Talk’s in the past, you are missing out on some great community knowledge transfer and friendships. The tech talks will be on the Community Stage in the VMworld Hang Space. It was a hit last year, and we’re bringing this to you again. The group discussion gives others a chance to share their experience and give their view on a product. These are a great way to not only learn more collaboratively, but to share knowledge, and get to know other PowerCLI users like yourselves. This is definitely a rewarding experience. For those who do not know what the Hands-on-labs are yet, the HOL is a virtualized lab powered by VMware that allows users to spin up specific products or scenarios found in the ‘Labs’ section of the site. Users are given several hours to try out products using your web browser. Each self-paced lab is guided with a manual and is also split into modules, allowing you to take all or part of any given lab. This entry was posted in VMworld and tagged PowerCLI, Sessions, VMworld on August 5, 2014 by Brian Graf. Brian Graf is a well-known VMware evangelist in the IT community. Over the past 5 years, Brian has done Technical Marketing for PowerCLI Automation and ESXi Lifecycle, Product Management of vCenter Distributed Resource Management features (DRS & HA), and is currently working as a Technical Marketing Manager for VMware Cloud on AWS. Brian is a co-author of the PowerCLI Deep Dive 2nd edition book. He has helped develop VMware certification courses and exams and presents around the world at VMware User Conferences, AWS Summits, Interop, as well as other industry Conferences. Brian is also a Microsoft MVP. 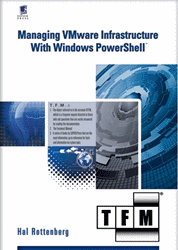 bhanu on Managing VMware with PowerShell webinar. vinod on Managing VMware with PowerShell webinar.